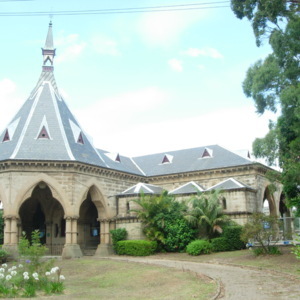 James Barnet, Byzantine, capital, cemetery, Chippendale, column, funeral, Gothic, Gothic Revival, lancet window, Moorish, Mortuary Station, moulding, New South Wales, NSW, pointed arch, railway, Regent Street Railway Station, Rookwood Cemetery, sculpture, spire, Sydney, Venetian Gothic. The Rookwood line was officially closed in 1948 but the renamed Regent Street Railway Station is still sometimes used for special events. 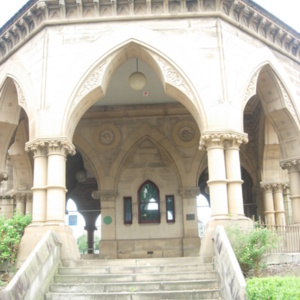 Byzantine, capital, cemetery, Chippendale, column, funeral, Gothic, Gothic Revival, James Barnet, lancet window, Moorish, Mortuary Station, moulding, New South Wales, NSW, pointed arch, railway, Regent Street Railway Station, Rookwood Cemetery, sculpture, spire, Sydney, Venetian Gothic. 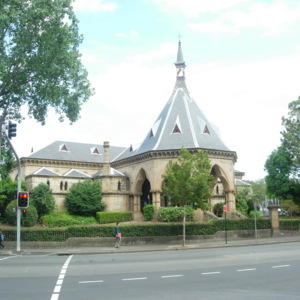 “(Former) Mortuary Station, Regent St, Sydney,” Medievalism in Australian Cultural Memory, accessed April 23, 2019, http://ausmed.arts.uwa.edu.au/items/show/1284.